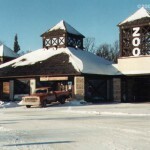 The Zootique is a public zoo located in Winnipeg in Canada. 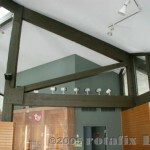 The main visitor reception area is a traditional timber construction built from locally grown Canadian oak. Rotafix recommend, when using oak in internal construction, that the moisture content of the timber is less than 20% in order to avoid the drying process resulting in warping, twisting and crack of the timber. 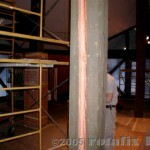 In the case of beams used in the Zootique building, over an extended period of time, the drying of the oak had resulted in cracks appearing in the timber beams. Rotafix were asked to provide a solution to maintain the structural strength and integrity of the beams in situ using a low disturbance method. 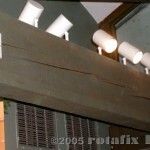 Where possible Rotafix recommend replacing timber with timber. In this project the splits and shakes were irregular in shape making it difficult to create the replacement timber fillets that would be used to fill the slots . 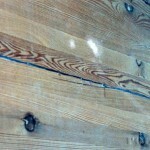 To overcome this challenge a router was used to create regular shaped slots that followed the line of the cracks. Fillets were manufactured from species matched oak with a moisture content similar to that of the oak beam to ensure expansion and contraction of the parent timber was the same as the fillet. 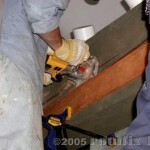 Timber fillets were inserted into the routed slots and bonded in place using Rotafix Structural Adhesive (RSA). The thixotropic nature of RSA meant that it could be used vertically. Rotafix recommended that fine cracks of 0.5mm to 4mm in width could be filled using RSA, a two-part epoxy structural adhesive. 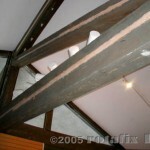 The gap filling adhesive restored the integrity of the structure without the need for the timber fillets to be inserted. 2.6mm diameter holes were drilled into the beams to a depth of 50mm to allow the deep injection of RSA using a hypodermic syringe. The holes were then capped with a timber plug to blend in with the timber. 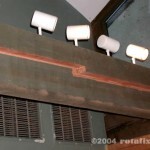 To complete the repairs the beams were painted ensuring that the repairs were not visible. For further information about the Resiwood system to repair timber beams please contact us on +44 (0)1639 730481 where one of our technical team will be happy to assist.